ESL teachers are creative language experts who have many transferrable skills. This workshop will look at how you can combine your ideas for ESL products, resources and/or services to earn additional income as a teacherpreneur. Specific examples of some successful teacherpreneurs will be provided along with links for resources and some specific steps to help you to monetize your expertise. Teacherpreneurs do not have superpowers but are just regular teachers like you! Patrice Palmer, OCELT, M.Ed., M.A. has 20 years’ experience as an ESL Teacher, TESL Trainer and Materials Writer. Patrice has taught students from 8 to 80 years in a variety of programs. She now spends her time doing the things that she loves, such as writing online courses, blogging, providing instructional coaching and helping teachers transition to teacherpreneurs. This session will provide a brief explanation of colligation and show that, in addition to meaning, form and pronunciation, learners really need to know the grammatical patterns words are used in. This new approach to teaching grammar will be demonstrated with several motivating classroom activities that raise students’ awareness of colligations and encourage acquisition. Ken Lackman spent seven years in Prague teaching English and developing teaching materials. After returning to Canada in 2002, he worked as the Academic Director at EF Toronto until 2007. He is currently working as an ESL instructor at Ryerson University, a CELTA trainer at Greystone College and a freelance writer. This session will introduce new and experienced Tutela users to the many improvements and features brought about with the launch of Tutela 3.0 in January. Features covered in this session include Resources, Groups, and Collections along with ways to make Tutela become an online home for those in language education. Starting in 2012, Tutela has become the online resource repository and professional development site for language instructors and administrators across Canada. In January, Tutela launched the latest edition of the site, which includes a number of improvements and features such as a new Collections feature where various resources, events, groups, and forums around a single topic are collated into a single page. This session will focus on assisting new users to Tutela in maximizing the site's potential for their own situation. More experienced users will also pick up a number of tips and tricks that will streamline their time on the site. Attendees are encouraged to follow along on Tutela during the session. Diane Ramanathan , OCELT, is a community coordinator for Tutela. She is responsible for facilitating training and webinars. She is also an online instructor for LINC Home Study and teaches for the TESL Program at Algonquin College. Some of TESL Niagara’s LINC/ESL instructor members have expressed a desire for more collaborative time to discuss PBLA with their colleagues. 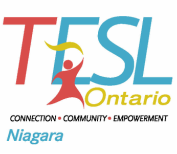 In response to this, TESL Niagara is offering time during our Spring Conference for interested instructors to drop in and share their PBLA work, experiences and questions. The goal of this session is to provide instructors with a collaborative, non-stressful environment where they have time to ‘check-in’ with their peers, compare notes, and share best practices. For those who wish, a PBLA Lead Instructor will be available upon request. Please use the security question: What does the E in TESLNiagara stand for? NOTE: An email confirmation will be sent when E-transfer or cheque payment is received.